Vintage Shirt....So Far, So Good! How To Pre-Shrink Wool... Fast and Easy at Home ! Many of us are ready to sew our fall wardrobes....me too! So I thought you might be interested to know of an easy yet professional method that I use to pre-shrink wool yardage. It is one of many that I learned during my Tailor Apprenticeship. First...the fabric! This luscious yardage is from my stash. One of the pieces was purchased from Gorgeous Fabrics several months ago. 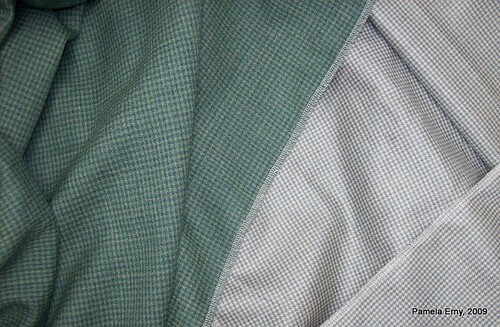 The green check yardage is 100% tropical wool crepe, the gray check yardage is a blend of wool and silk. when we can do it easily at home? Next, wet some clean thick towels with HOT water until they are wet but not dripping. Set the dryer on HIGH heat, and tumble the fabric and hot wet towels for 30-40 minutes. That's it! Your wool yardage is now ready for the needle! 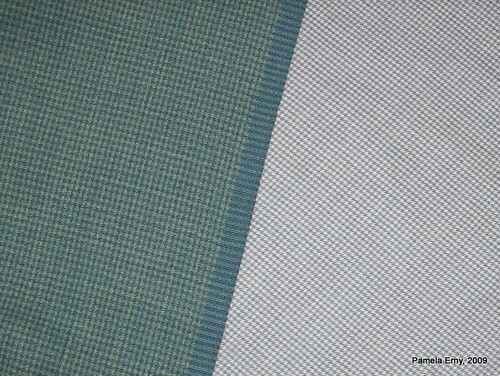 The appropriate interfacing for this fabric is PRO-WEFT Supreme Fusible Light. As you can see above, this "Machine Shrink" method did not visibly change the fabric at all, and it's hand is still soft and smooth. However it did shrink. Each piece was 60" wide and 2 yards long before steam-shrinking. After, the green 100% wool piece measured 59.5" wide and is 2.5" shorter in length. The gray wool/silk blend is still 60" wide but 1.75" shorter in length. Hey, another great idea. But doesn't all that heat and steam hurt the wool? "Anonymous"...No, it doesn't hurt the fabric at all. It makes good sense to steam shrink wools this way. Because...when we are constructing a garment, what do we use when we fuse interfacing and press seams,lapels, etc? Pam- you read my mind! I am making a Chanel jacket for the sew along and was just wondering how to pre-treat my wool boucle. Thank you! I will add this post to the "helpful hints" for the sew along. Thanks so much for the tip and for the comment on my blog. Fabulous tip, Pam, thank you!!! That has to be one of the easiest methods I've seen for pre-shrinking wool. Thanks for sharing. Thank u for posting this. What if I have a dryer with a steam function? Can I toss my wool gabardine in without the towels? I would still tumble the wool yardage with some DRY towels....just to keep the yardage from wadding up into a ball...or twisting while it is steaming. And since you have a machine that produces a continuous full amount of steam, I would reduce the time to 20 minutes. What a great tip - thank you! Thank you! Wow, this sure beats steaming with an iron, which takes hours on end! Awesome tip! I have several wool that are waiting for this step. Many thanks for the tip. I have some wool yardage in the stash and was dreading the chore of dragging it out and steaming it on the ironing board. You handed us procrastinators a perfect solution. This sounds like a great method. I'm going to try this! Do you have any problems with lint from the towels going all over the wool? No, no problems with lint, however, my fluffy towels are not brand new...so they've lost all that "new towel" lint. Also, while I find lint in the dryer's "lint trap", I don't (at least so far..and I've been doing this for 20+ years) have trouble with lint clinging to the yardage. This may be because the towels are not being agitated with the fabrics in a wash cycle. Pam, thanks a million times over for this tip! It's time to start cutting into the wool fabrics for fall garments, and you can be sure I will use your "pre-shrinking" technique when I do! Fabulous Tip, Pam! Thanks so much. Since I sew so much with wool, this will save me dollars, and even more importantly, lots of time. I've been doing the "wrap in wet sheet" type for some of my smaller yardages, but when it's 3-5 yards, I'd been taking it to the cleaners. This is wonderful. Wow! Thanks for the wonderful tip. I live over a hundred miles from the nearest dry cleaner. This technique will save me loads of time. Interesting, and sounds easy! I have plenty of unwashed wool in my stash, and with fall sewing coming up, I'll definitely give this a try. Fabulous tip Pam! I've never heard of this before but it sounds perfect so I will definitely be doing this in future. Thanks so much for sharing. Thank you, thank you, thank you! I have some wool that I want to make slacks from and I need to do this first. This is a fabulous tip --- thank you for sharing it! Thank you, Pam! This is a wonderful idea and sure beats the heck out of steam pressing at home - a chore that I despise! I posted about this tip this morning, as my 2 newest wool pieces were tumbling in the dryer. They are now cooling down waiting to be remeasured. Pam, Thanks for this method. For some reason, my dry cleaner thinks that wool yardage is spun gold, and charges accordingly. I'm especially paranoid about wool crepe, which is reputed to have residual shrinkage. Would you do anything different with wool crepe, or shrink it more than once? Meredith...there are many weights and qualities of wool crepe. Cheap wool crepe tends to suffer from residual shrinkage more than high quality wool crepe. However, it certainly won't hurt to repeat the "pre-shrink" process with any wool crepe. And a sewing note regarding wool crepe: use care when constructing your garment. Do not press too hard, and when using steam to set an edge, follow swiftly with a wooden clapper to absorb the moisture. When using a dauber (or carefully directed steam) to steam-shrink sleeve cap ease (for example), do so carefully and without too much heat. "Pamela, my dear...when making the garment, it's important to remember that wool is NOT muslin!" I am beyond thrilled with this suggestion. I have been mulling over this situation for about 2 weeks. I had decided this morning that I'd just get out the steamer and go to work that way. Now, thanks to this post, I'm going to use the towel/dryer method. thanks!!! I do have a question: do you think this method would work for raw silk and faille crepe? (fingers crossed). However, it won't hurt a bit to toss a 6"x6" swatch (10"x10", if you can spare the cut) into the dryer with a hot wet towel or two, and see what happens! Thanks Pam. I did test swatches with handwashing and air drying. The raw silks are tweeds The raw silk came out fine, a little fulling with the faille. I'm getting ready to do my wools, so I'll toss the swatches in and see what happens. I am going to try this (like right now!) Thanks Pam. BTW, could I try this with designer silk chiffon I bought at facric.com? Regarding your silk chiffon. I don't know. Try what I suggested to Christy, (^Above) about testing a swatch. Oh Pam I will remember this tip when I don't need a facial from the steaming method I presently use! Just surfin' online and notice that you always [and promptly] answer questions posed in your comments section. Love to see that and often don't. I just wanted to let you know that I tried this with some Loro Piana wool that I have. It worked beautifully. Thanks Pam! This info is exactly what I need to wade thru a fair amount of wool I just accumulated. Thanks for this tremendous money and time saver, Pam! Hi Jan...well I DO use the dry-cleaner for finished garments. And I do not wash most wools (except for wool jersey, which I hand wash gently in shampoo, roll in a towel to get most of the water out, then lay flat to dry). So glad to know this tip. I just received a couple meters of very high end quality wool and wondered what to do before cutting. And DUH, never even considered that I would be pressing between each step of the process. How about a wool and cashmere blend? Same advice? SkitzoLeezra, With Cashmere or Cashmere blends I always take the gentlest path. When I pretreat any fabric of 100% Cashmere or blend, I do it by steaming the yargdage. Either at the Dry Cleaner, or myself with my hand-held steamer (I've got one of those garment steamer devices, mainly used to finish my custom shirts before they get shipped to clients). If you have enough of the cashmere-blend fabric, you could test a large swatch (at least 8"x8") with the "in the dryer" method I use for wools...and see what results. I have a retail store type steamer and absolutely love it so will try that on my fabric. 'Preciate your knowledge and time. Thanks for the tips, will this work for wool suiting and wool flannel? sulovessew... I use this method to pre-treat wool suiting and wool flannel. If you want to test it first, toss a 5x5" square in the dryer with a load of wet clothes...tumble it for a while, take the swatch out and look at it,check the surface, and measure it for shrinkage. If you like the results, do the entire piece alone in the dryer with very damp hot towels as I describe in my post. My problem is that I don't have a dryer. Would it work if a place my cloth (wool crepe) between the two wet towels on a flat surface and let it dry naturally? Hi Irene...your best bet will be to steam your yardage with a steam iron. It is the steam from the towels in the dryer that pre-shrinks the wool. Alternatively, you can do what is called a "London Shrink"-- roll your yardage in a *damp* sheet, let it sit for 24 hours, then line dry your wool yardage. Hi Pam! I love your blog for the wealth of knowledge you share with your public - you are definitely a trusted resource on the web! I'm wondering if you think I could use the dryer & damp towel steam shrink method on 100% camelhair coating (purchase from FabricMart). I haven't yet tried it on a swatch so I wanted to get your thoughts first. Thanks in advance! Hi Roseanne...thanks so much for your nice compliment...you've made my day! I have never tried this technique on any other fabrics but wool or wool blends. So, I cannot predict how it will work with your camelhair. My suggestions would be to take a scrap of the fabric (a 4"x4" piece), spritz it with some water on both sides, and then toss it in the dryer to see how moisture and heat affects the piece. Some camelhair and cashmere have a definite "nap", and with these napped fabrics, traditional steaming (along the direction of the nap...following the smooth direction)is usually the best way to prep them. Thank you so much for this piece of information. I came to your blog from another site and I'm glad I did. I do want to say that if you use dryer sheets in your dryer you might want to clean the dryer before putting your fabric in it. I also would like to share a tip I got from a textile chemist on how to finish silk. To get a glass like finish, soak your silk in warm water until completely wet, place the silk on a very smooth surface. I use a piece of heavy Mylar. Using a rolling pin, start at on end and roll the fabric flat. This will push the water out of your fabric, the silk needs to be wet, but not dipping wet. Once it is smooth, allow it to dry completely. You will be amazed at how beautiful your silk will look and feel. I used this process on a piece of silk I had woven. I was blown away by the results. thanks for the tip! i'm new to sewing and wanted to make sure i have done everything possible to make this dress last many seasons. i love your blog! how big of a towel is needed? you mention one or two. is that bath towels or hand towels? i have 3 yards of a wool blend. thanks for your help! Hi Jennifer...I use 2 bath towels. Do make sure they are more than damp, but *not* "dripping wet"